You can do any of those things on any Supergun with the right accessories. Most of the Superguns I have seen have Neo Geo controller ports as a minimum. From that, you can. Buy a Neo Geo extension cable ($8) and connect the other end to a 2 row db15 breakout board ($7 on eBay). The breakout board allows you to connect wires to numbered screw terminals and hook up joysticks and arcade micro switch buttons. It's incredibly easy to build a Supergun control panel like this. I just made one for myself. On the video hookups, if you buy a Supergun that only outputs RGB, you can buy JROK which converts RGB to NTSC (SVideo or composite) or component video. Or you can just buy one which has the port you want built in. eBay is littered with the sort of low cost upscalers you would find in many Superguns with HDMI out. You might get better results buying a regular rgb Supergun and choosing your own scaler like the Xrgb mini or OSSC etc. I figured out my Supergun issues so I thought I would share just in case it helps someone else here. It turns out that the excessive brightness when displayed on consumer level rgb monitors (BVMs, PVMs, Ikegami and rgb scart TVs etc) was caused by the power supply. These cheap eBay Superguns use regular PC ATX PSUs which is great for convenience and cost but.... cheap Superguns can be very sensitive to excess voltage or shortfalls. A PC might work fine on 4.7v from the 5v line but not arcade PCBs so check you psu before use. After switching out my cheap Chinese PSU for a reliable one, I was able to display a nice image on my Ikegami monitor at correct brightness levels. The issue when using this Supergun on my arcade monitor was vertical hold problems. As the Supergun works fine on my Ikegami, I concluded that this is most likely caused by the sync on composite video. I have ordered another scart to BNC adapter but this time, I got the one with a built in sync stripper. I think that will solve any remaining issues. This $60 eBay Supergun actually works quite well now. @Classicgamer, Please don't take it personally, but I just think it's important to explain a few things about that Vogatek/arcade in general, so that misinformation isn't spread elsewhere, too. I've seen that supergun before, and it does have resistors on the RGB lines and the CSync line, meaning that it is capable of bringing the signal amplitude to acceptable levels (below 1Vp-p). Sure, it doesn't buffer and impedance match the signals, but the signal amplitude is safe. It was overly bright on the broadcast monitor and fine on the Ikegami with the 75R termination turned on - this basically means that your broadcast monitor lacked that termination (some monitors require external 75R termination caps). This has to do with the exact game you ran and your monitor, not the supergun. Arcade PCBs can output the CSync at 3-5Vp-p (TTL level), so there's no way the signal strength is too much for the arcade monitor. Arcade PCBs output perfect TTL Csync, so Sync Strike is not necessary at all. Maybe to act as a buffer (but there are better ways for digital signals), but not as something that can "fix" your sync from the arcade PCBs. Again, the arcade PCBs output Composite Sync, not Composite Video, so there's no point in stripping anything. While I agree that +4.7V is a bit low, it has nothing to do with the supergun outputting overly bright picture. Furthermore, that supergun doesn't have any video signal buffers, just a bunch of resistors, so the supergun itself cannot be affected by under/overvoltage at all - it will be the actual PCB game. I cannot explain why it started to output "normal" picture when you changed the PSU, but I'd start looking for the root cause in your specific setup (TV/monitor setting, video cables etc.). Hope that helps. The whole point of a Supergun is to output RGB at correct voltage for consumer TVs (which is the same as what is used by most pro monitors too). My Ikegami monitor requires the same 0.7v rgb as consumer TVs with RGB scart ports. Any Supergun should be capable of displaying an image at correct brightness on consumer displays or any broadcast monitor. But, using a poor quality PSU can most definately mess up the image by making is too bright or other issues associated with too much (or too little) power. It has nothing to do with the Supergun, using the wrong voltage causes issues even if you hook up the PCB directly with a Jamma Harness which is why they sell those jamma edge adapters with built in voltage meters. I.e. Because the wrong voltage can damage monitors. My first Supergun which I owned in the 90s had built in voltage regulators which prevented such issues. This Supergun is cheap crap so it has no such protections. So, I wouldn't use one without a high quality PSU. And, I suggest checking the voltage before connecting to a display (or scaler). When I first connected this Supergun to my Ikegami monitor, it immediately turned on the over-voltage protection light which means that the Supergun is not doing it's job. It's job being to output the rgb signal at correct levels for consumer displays. Switching to a smaller PSU made it display at correct levels (although not for all games). I don't know much about specifying what size resistors are needed. I can see plain as day though, that this Supergun has far less than my old (far higher quality) supergun. Personally, I think it is worth spending the extra $50 to get one with more overvoltage protection to protect expensive display kit. I see. Not going to try to set you straight again, just tried to help by giving you facts. Welp boys, time to throw away those HAS superguns, ClassicGamer has spoken. This is my supergun, called the Sentinel. It's in the last phase of prototyping, a few improvments and additions are in the final version which I hope to fabricate soon. The picture above therefore isn't indicative of the finished product. Quite compact at 130mm x 60mm. 75 Ohm or TTL sync output. LPF which can be enabled or disabled. RGB Scart video output, MD2 DIN. Component video output via HD RetroVision cable. Composite and s-video output via hat. VGA (15K) output via hat. 3.5mm audio jack which can be utilised as an output or line level input. Neo-Geo controller inputs. I produce my own Snes / Mega Drive controller adapters. Compatible pinout with Undamned USB decoders. Can also use Tototek PlayStation 1 adapters, 8bitdo wireless receivers, tons of controller options. Test and service tactile buttons. Dipswitch to enable buttons 4,5,6 for each player from the jamma edge. Onboard voltmeter, neatly flush mounted, 5V / 12V selectable. ATX or Arcade PSU via harness. Currently in the process of designing a plexi case for it. That about sums it up. Pretty happy with how it's turned out. Pricing hasn't been fully finalised but I would estimate $130 USD and up pending optional extras. Bit more of an idea of where I'm heading, 4 player controller hat, various video hats, plexi base plate etc. Could you guys tell me which ATX power supply is reliable enough for a cheap supergun to work correctly? My PCB needs -5v so the ATX power supply must have this output. Correct, negative 5V was dropped from the ATX standard around 15 years ago. I believe post ATX version 1.3 is when it started to disappear. This is why some supergun boards incorporate onboard -5V generation. What I did is purchase an older ATX from a computer recycling store that still has -5V. I'm on the waitlist for a HAS, but in the meantime, I'd like to make use of the retroelectronik supergun that I bought before seeing all the negative comments here. Could I make the Retroelectronik board safer for connecting to my PVM if I attenuate the sync signal with a 470R resistor and put a buffer like this Raphnet one for the RGB signals between the arcade PCB and the SCART connector on the supergun? The HAT board I'm making will work on both versions of the PARSEC. 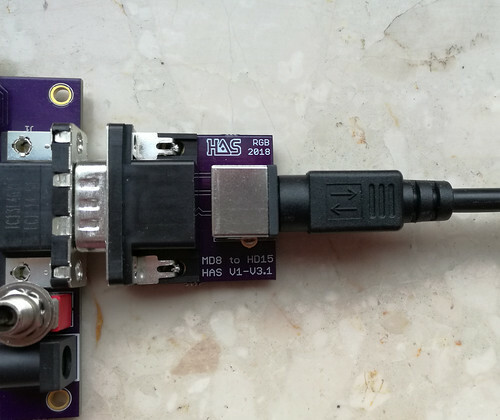 It adds VGA and 8p mini-DIN connectors for RGB outputs and 2 sync modes. I've bought a dirty cheap Vogatec MK II supergun on eBay a month ago and now I'm doing some tests with my Pit-Fighter PCB. It's somewhat tricky to adjust the sync and color settings, it is way too sensitive!! The equipment is connected to a LCD HDTV (Samsung). The supergun has 2 modes called "Sync Normal" and "Sync Correct". When in sync normal, the image stays steady but the colors are completely wrong. And when it is in sync correct, I can get correct colors but the image stays shaking, with tiny waves all over the screen. This weekend I will try to switch it back to sync normal and move the sync width knob to see if I can get correct colors in this mode as well but without the little waves shaking the whole screen. All the rest is intuitive enough to me to understand lol. Also, I noticed that it crops the top and bottom sides of the screen (just a little bit but it's kinda annoying). Is there any way to fix that without having to stretch the image at the TV settings? I'm using a 550w ATX power supply taken from my desktop computer. It does not have -5v support which is required by this game for sound and something else I don't remember. I will buy a new 200w ATX power supply which has -5v support in a near future. Could the lack of -5v be interfeering in the image in some way? If someone here has an MK II supergun and an LCD TV as well please let me know. I guess I will need some advice on how to get the best image possible out of it. Can anyone recommend a cable to hook a HAS supergun up to an OSSC? The HAS's mini din output goes straight into a Framemeister, and I have a SCART->Framemeister adapter, can I flip the adapter around and use it for HAS->OSSC? I fiddled around with my SCART/JP21 adapters like you're describing but couldn't get it to work. I think I got video in one configuration but the color palette was drastically reduced. Like completely missing red or something. I believe I ordered one of the NeoGeo cables from retro-access.com. You could connect the HAS to the OSSC using the 8pin mini din to Scart cable like this or this. It looks like this would only be the board itself, I'd need to get the mini din and VGA connectors separately? Thanks for the help! I'll definitely be buying one of these three solutions. I would love to review your super gun. I am getting my IREM multi soon. I own 2 MVS and an STV Multi as well.